A lovely casual long pant sleeveless jumpsuit or cute romper that features a gorgeous summer floral print design that will fulfill all of your new season desires. This comfortable effortless chic jumpsuit is a must-have for the warmer months and also stand out from the crowd as it's a unique design and one of a kind. 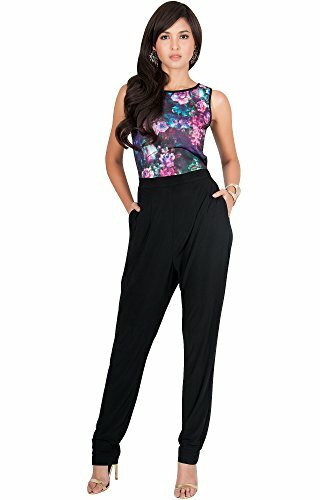 With our wide range of color, this stunning jumpsuit is the perfect option to wear as a date night jumpsuit, as a work pants suit for your working days, as a cocktail pantsuit or even a party romper with long pants or for something more casual. Furthermore, this versatile jumpsuit is available in many sizes and it really does make a wonderful plus size romper or plus size jumpsuit for women. The color is Hot Fuschia Pink and Petite Size Small / S / 4-6.